This blog was originally published in part on TriplePundit. Pico-solar lighting and solar-home-systems have proved themselves as revolutionary entry-level energy access technologies for low-income rural communities; See IDCOL’s success in Bangladesh, and recent multi €m investment in Berlin based SHS energy access company Mobisol, active in East Africa. These technologies have kick-started a base-of-the-pyramid push towards energy independence and it is critical to continue this forward momentum in order to deliver a real long-term solution for rural energy and water access. Next generation energy access solutions must expand across multiple energy sources, enable productive usage, deliver economic independence and effectively scale, in order to provide future-proof useful energy and water to rural communities and help them truly rise out of poverty – the recently released Energy Access Tier Framework from The World Bank describes this in more detail. 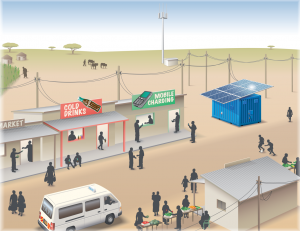 Innovative nano- and micro-grid technology solutions are being developed at a tremendous rate, nevertheless, practitioners active in this space of decentralized rural electrification still face the inherent financing challenges of developing sustainable business models, satisfying non-standardized risk mitigation requirements across different funding sources and securing project financing in the void between microfinance (<$10k) and development finance (>$5M). These challenges can give rise to a potential trade-off situation where financiers require the project developer to demonstrate strong project cash flows and mitigate perceived risks in order to secure project financing whereas the community needs to able to afford and truly benefit from the energy and water service provided. The obvious question then is how to balance this potential trade-off in practice; or if we think out of the box, how to turn this trade-off into a win-win-win situation. 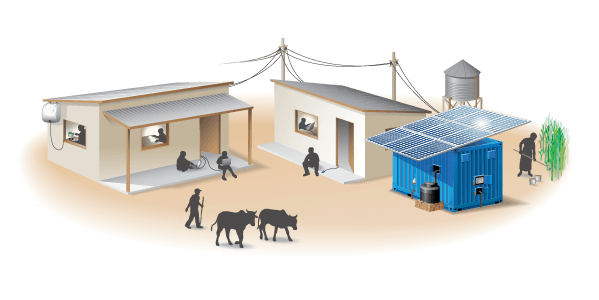 This is where encouraging Productive Energy Use (PEU) alongside household energy consumption is proving itself as an ideal strategy for the community, the micro-grid developer and financiers. In simple terms, the fundamental resources (energy & water) needed to operate local wealth generating businesses are provided alongside access to capacity building and low-cost PEU equipment with the goal of capturing a portion of the new wealth generated as project revenue in order to satisfy the requirements for commercial investment. PEU comes in many forms and is driven by diverse business models depending on the local context, resources available, local capacities and traditional industry. Insightful papers by GIZ and IIED go into extensive detail on methodologies, benefits and pitfalls of a PEU-based approach and we need to continue the learning process as new and innovative needs-based business models are developed almost as quickly as energy becomes available. We argue that the significant productive potential in rural cottage industries are key to the successful implementation of energy access projects, and a crucial step toward unlocking this industry is the delivery of fundamental resources and the creation of a market for clean energy PEU technologies. Despite encouraging results from pilot projects, further cross-sectoral communication, standardization of regional risk mitigation procedures, development of common payment collection technologies, convergence of common business models and transparent dissemination of lessons learned through PEU driven projects are needed in order to bridge this financing gap. Financiers need to be convinced that a detailed understanding and analysis of revenue derived through household energy consumption alongside diverse PEU activities in the decentralized rural electrification space can replace the traditional Power Purchasing Agreement as is the norm for larger grid-connected renewable energy projects. In addition to this, an increased focus needs to be placed on the development of local and national value chains and micro-financing mechanisms that enable implementation of productive use technologies. The United Nations’ recently proposed sustainable development goals set ambitious targets for energy access, financial inclusion and economic development; we believe it is critical that the energy access industry, the financial sector, policy makers and governments take PEU into consideration if we are to collectively reach these goals. Needs-based rural ingenuity is a wonderful and very tangible thing, and thus we at RVE.SOL see our role as enablers of bottom up wealth generation by delivering a platform through which local entrepreneurs gain access to the resources needed to develop thriving organically grown local businesses. Our intention is for KUDURA to do for rural Productive Energy Use what the iPhone did for the mobile computing, i.e. to provide a future-proof standardized platform that can be easily adapted to the end user’s needs and fosters the development of local wealth generating businesses. A practical example of this platform in action is the organic development of a local entertainment business at our pilot project in Sidonge, where the standardized reliable AC energy we provide through KUDURA and money saved through reduced energy and water costs has allowed the community to invest in a local cinema which draws crowds from neighboring villages bringing wealth into the community, improving project revenues and helping them to pay for household energy consumption. Another model that we are implementing is the vertically integrated production of locally produced filtered bottled water to be exported to nearby towns at lower prices than branded water; allowing the community to convert an abundant, but unused resource (unclean water)(*) to generate wealth and ultimately secure cheaper access to potable water for local households. We are very aware of the importance of understanding the local context in our design thinking. In our experience pragmatic decision-making prevails in rural communities with scarce income; if there is no perceived ‘need’ for a household to spend money on a resource, they will not do so, unless the perceived ‘desire’ or value is very high. Further to this, a survivalist instinct can strongly impact decisions made for the benefit of the community, often causing an external observer to misinterpret a difficult decision as ‘short-sighted’. Thus if we are to successfully scale our solution, we as practitioners must work with and support local partners and NGOs in educating the community as to the opportunities that high quality energy and water bring in terms of long-term wealth generation potential. This is something RVE.SOL is working very hard to do, alongside building the demand for productive energy use technologies and value chains with national and international technology partners. In summary, productive energy use is not a one-stop solution, nor is it without risks, however we see it as an important driver for cash-flow positive decentralized energy & water access. The key is to unlock the potential in rural regions by providing a reliable, easy to use platform that enables the conversion of local ideas into successful wealth generating businesses; we believe KUDURA has the potential to do just that. Please give us your comments, questions and feedback on this blog. Please also share it to keep the conversation going and if you are in Barcelona on the 16th / 17th of September stop by at the MicroGrid Innovation Forum to hear myself, Setu Pelz discuss innovative business models for cash-flow positive microgrids in rural development. (*) Extensive Environmental Impact Studies are conducted to ensure sustainable usage of ground-water resources.